Odds are you haven’t followed the US Supreme Court’s recent ruling that’s struck down a ban on commercial sports betting in most states and is opening the floodgates to an estimated $150 billion market in wagers at casinos, racetracks, mobile devices and everything in between. 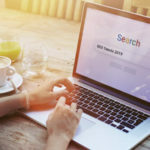 In this Unwrapping the Secrets of SEO, we’ll examine how this tectonic shift will be a game of Visibility winners and losers in this lucrative niche. In this high-stakes battle, everyone from media and data companies to offshore betting institutions will have to play big online to win. To set the scene, sports betting has been illegal in most U.S. states since 1992. The Professional and Amateur Sports Protection Act, also known as the Bradley Act, outlawed sports betting nationwide, with the exception of sports lotteries in Delaware, Montana and Oregon, and licensed sports pools that were already taking place in Nevada casinos. Big money suddenly went underground, overseas or online. But states could clearly see the lost revenue opportunities in the envious results coming out of Nevada. In 2017 alone, the Nevada Gaming Commission reported legal bets earned the house $248.7 million on a whopping $4.8 billion in bets. New Jersey, home to many casinos, wanted in on the action after missing the window to take advantage of a congressional exemption that would have allowed sports betting to take place there. The state and racing interests sued the National Collegiate Athletic Association, arguing the Bradley Act infringed on states’ 10th Amendment rights. A 6-3 Supreme Court majority agreed. The scramble for a piece of the action has only just begun. The challenge will be for mobile betting companies, geolocating services and bookmakers to create a legal betting environment enticing enough to steer current high rollers away from the illegal betting avenues they’re already comfortable using. Before the ruling, Vegas casinos looking to entice people west from Atlantic City configured their websites to make it clear sports betting was on the table. It’s something that’s not searchable through online travel agents, so people have to look mainly via search engines to find hotels with sports books. 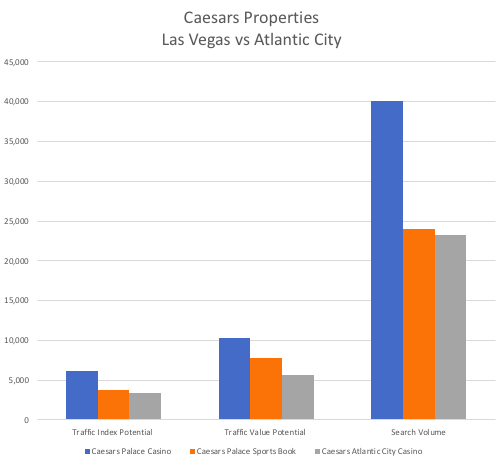 Using Searchmetrics data, we analyzed the traffic index, traffic value potential and search volume for Caesar’s casinos in Las Vegas and Atlantic City. The Las Vegas casino and “Caesar’s casino sports book” appear in Google searches for sports book, while the Atlantic City currently does not. We saw a different picture for MGM Resorts properties. 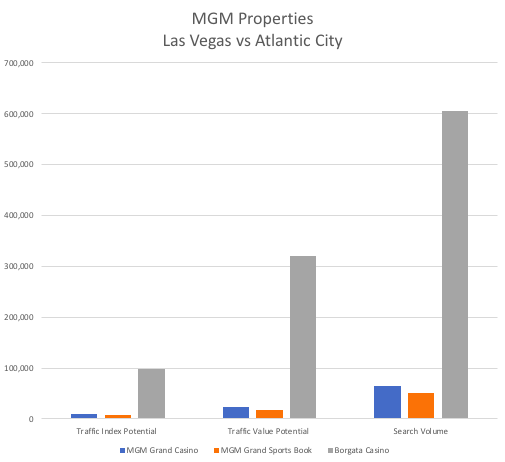 As you can see, Atlantic City’s Borgata Casino trounces MGM Grand and its sports book. That could be because the Borgata is a fairly recent acquisition by MGM, and it’s riding high on in-state internet gambling that was legalized in New Jersey in 2013. Many states that aren’t known as big casino destinations are hungrily eyeing the great equalizer: mobile. Matthew Holt, Vice President of CG Technology Sports Books told the Las Vegas Review-Journal that people started betting more when casinos began creating apps that would let them bet on their phones. Now it’s hard to find a sports book in Las Vegas that doesn’t have a mobile app, he says. One way any of these companies can gain a leg up is to help gamblers navigate the still-confusing plethoras of rules and prohibitions that govern the industry. 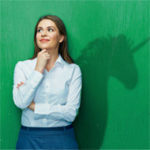 One big rub is that, whether you’re operating from a desktop pc or a mobile device, interstate gambling remains prohibited except for a novel pact created in 2014 by Delaware and Nevada. That means residents of those states can join online pools to bet. Now that the Supreme Court has cleared the way, other states are sure to jump in. Winning the education game will be key to winning the online stakes; a single Google search for ‘can I bet on poker in Vegas from California’ turns up 5.8 million results. 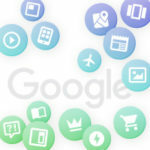 Winning Position 1 or a features snippet in Google search results is an easy way to vault past competitors eyeing a share of the market, particularly in a state as large as California – home to 38 million residents. 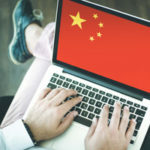 The interstate gambling prohibition that remains in effect could also be a boon for VPN providers, who create software that masks the location of an online customer and can be set up to look like that person is living in a state where intrastate online gambling is allowed. According to Google data, over the week the ruling was announced, there was a spike in interest for VPNs with a focus on “sports” the evening following the May 14 ruling. But for every VPN maker looking to help scofflaws, there are geolocation companies that are working to stop them. 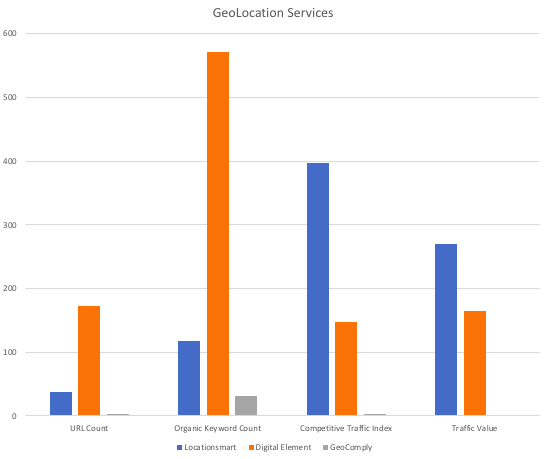 We looked at the Searchmetrics data for three sites with geolocation services that are used by gaming establishments such as MGM and Caesars to stop VPN usage. The graph below shows the SEO Visibility for Locationsmart, GeoComply and Digital Element. Basic blocking and tackling makes Digital Element a big winner over its rivals, and shows that winning in a particular niche is about recognizing the needs of customers and meeting them with a site that has great SEO hygiene. For companies looking to grab some of the cash and prizes, there is a lot to sift through as states work out their sports betting laws. Getting the cut of the winnings doesn’t have to be a gamble; putting effort into strategies backed by data can give you a leg up. When you’re betting against SEO, the other house always wins.